Travelers Rest Lodge offers deluxe, private cabins nestled in the aspen trees. Each cabin is beautifully furnished with attention to detail. The cabins have full baths, furnished kitchenettes with dining area, and fireplaces. Included in each cabin is a small fridge, microwave, toaster, full-size coffee maker (coffee and tea provided), dishes, silverware, cutting board, etc. Each cabin also has a roomy, covered log porch for enjoying the mountain front views. 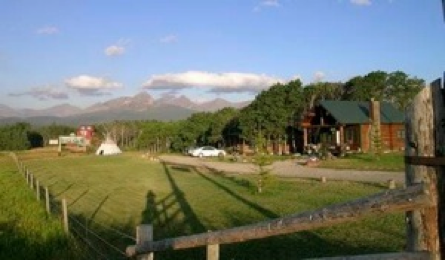 Located on the eastern edge of the town of East Glacier Park, we are close to dining, shopping, hiking, fishing, golfing, horseback riding, wildlife viewing, and world class scenery. We are just minutes away from the Two Medicine entrance to Glacier National Park, scenic Looking Glass Highway, and Going to the Sun Road. All cabins are non-smoking and pets are not allowed. Open April 15 through Oct. 1. For reservations, please call 406-226-9143 (summer), or 406-378-2414 (winter).